This 0.28 Carat t.w. Diamond Eternity Band sparkles with two rows of genuine brilliant round cut pave set Diamonds, which lend just the perfect dose of modern femininity to this sharp piece. 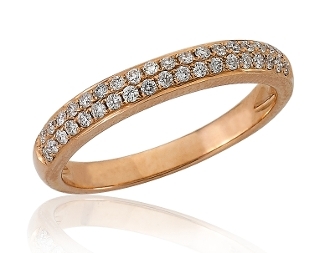 Masterfully crafted in luxurious highly polished 14 Karat rose gold, this dazzling Diamond band is complete with a triangular cut-out inner gallery designed to enhance the shimmer of the stones. For added appeal choose our Engrave option when adding to Cart. For an even more fashion-forward look select multiple rings in white, yellow, or rose gold.